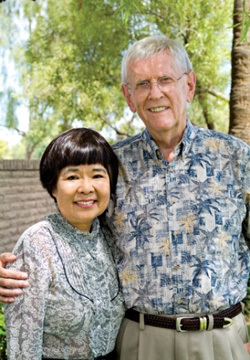 Jane and Donald Fausel, PhD, established a charitable remainder trust to benefit St. Joseph's Foundation and to honor the memory of Jane's elder brother, John Li, who died in 2005. John emigrated from China to the United States in 1999 and was in poor health at the time. He was not eligible form health insurance or Medicare coverage, but was able to enroll in St. Joseph’s Mercy Care for a low monthly fee. John received treatment for a ruptured aneurysm and for prostate cancer from St. Joseph's. "We were very impressed and grateful for the care he received at St. Joseph's and Barrow," says Jane. Both Jane and Donald want the trust to be a legacy to John’s memory and an acknowledgement of the medical, emotional, and spiritual care that the Li family’s “No. 1 brother” received at St. Joseph and Barrow.